ELEFSINA HOTEL, just 30 minutes from Athens and the city of Corinth, is a landmark of the developing and historical city of Elefsina and it offers four-star services. The hotel�s luxurious and ultra-modern facilities provide the ideal place to relax, enjoy and reinvigorate yourself, taking advantage of the unique services the hotel offers to all those who love the good life. The superbly equipped conference facilities offer ideal solutions for the most demanding professional and business events. The hotel has 83 rooms (6 suites), a 440-person capacity state-of-the-art conference centre, 2 restaurants � �To Stachy� and the �YK Roof Bar Restaurant� � and the Elefsina Lounge Bar, making it the ideal choice for an unforgettable stay. 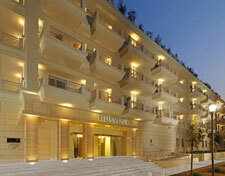 ELEFSINA HOTEL has four ultra-modern floors with 83 rooms (executive, superior and 6 suites). All hotel areas reflect a highly aesthetic design with discreet pastel colours and modern furniture. Each room has its own balcony, flat-screen satellite TV, mini bar, safe box, voice mail, direct phone line, high-speed internet access and air - conditioning throughout. The suites have a lounge and bedroom with all modern amenities. The ELEFSINA HOTEL was designed to provide full access to the disabled, ensuring them a comfortable and pleasant stay.